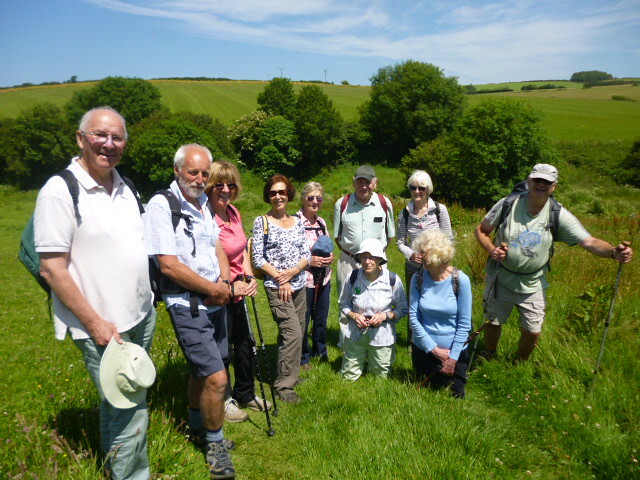 It was a gorgeous sunny day on 13th June for 12 members of the walking group to take in the beautiful views on the stretch from the National Trust car park at Coombe Farm on the outskirts of Fowey. First stop was at Polridmouth (pronounced Pridmuth) cove between Fowey and Gribbin Head. You can see Gribbin Head daymark in the background of the photo. Built by Trinity House in 1832 it was intended as a daylight navigation aid for shipping. Now owned by the National Trust it is open to visitors some Sundays in the summer. A flag is flown to show when it is open. In the absence of our usual walk leaders, Chris and Janet, and Annie, we relied on the knowledge of some of our group to tell us that during the Second World War, the lakes at Polridmouth formed a decoy site for nearby Fowey harbour. Decoy sites were a diverse group of structures, which were built all over the country under the direction of Colonel John Turner. Borrowing heavily from techniques developed at Shepperton film studios, Colonel Turner supervised the creation of more than 1100 imitation airfields, ports, and towns, each a few miles from the real thing. The aim was to fool enemy bombers into attacking the dummy site, thus protecting the genuine site. The lakes had been built behind the beach in the late 1920s. Dams were built around the lakes, and lighting set up, to imitate, as far as possible, Fowey harbour. The decoy site was considered especially important in 1944, when 2000 US Navy personnel were stationed in Fowey, in preparation for D-day. At least one bomb is known to have been dropped near Polridmouth. From here we continued along the South West Coast Path to Polkerris, a tiny hamlet, west of Fowey. It is here that you find Kilmarth, the last home of Daphne du Maurier. It is also the next cove to Menabilly, the long time home of the author. We stopped here for lunch in the sun, partaking of various beverages, food and ice creams at the beach shop. After lunch it was up the hill onto the road, taking in part of the Saints Way which runs for 27 miles from Padstow on the north coast to Fowey on the south. Through Lankelly Farm and back to our cars at Coombe Farm. 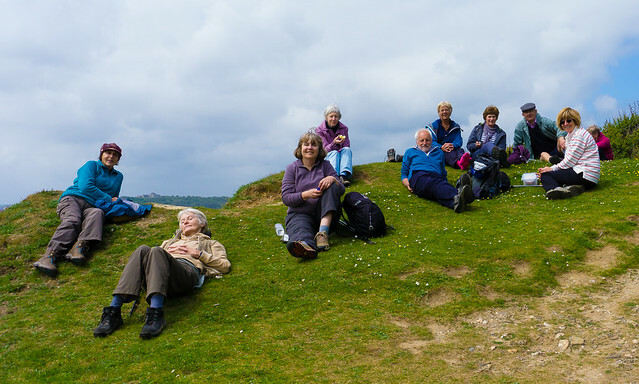 1) 5.5 MILE CIRCULAR WALK USING COAST PATH, SAINTS' WAY,FIELDS AND MINOR ROAD. On a bright and calm day fourteen of us, including yet another new member, set off from the Community Centre car park to drive the short distance to the large car park at Gorran Haven. 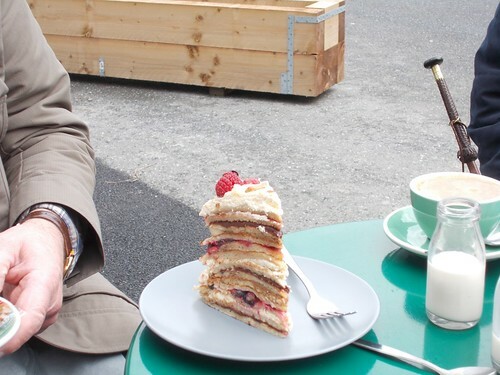 Our first surprise was that the car park fee was now at the summer rate of £4 and despite aggressive negotiation no OAP discount was available which left us less to spend at the nearby café. This was our first stop after walking about 100yds but it was 11.00am and we had a variety of drinks with cold and hot milk and buns from Chelsea buns, Eccles cakes(hot) and a mammoth doughnut which could have been used by the RNLI for rescue purposes. So at 11.45am with the sun beginning to brighten we began our walk on the coast path up the hill past the chapel and with views past Little and Great Perhaver Points and with the Jobbles Rock just out to sea. The views are stunning here not only the coast but also the rolling hills inland with sheep enjoying the lush grass. Passing Pabyer Point we see the white buildings on Chapel Point. The principal house was designed by the renowned arts and craft architect in 1936 and featured in Daphne Du Maurier's The House on the Strand and is a Grade 11 listed building. A great location for lunch as we look over the bay and the activities in the water. Turning inland and along the valley westwards towards Old Walls a delightful cottage with a pond in front and then up to Bodrugan Barton a family home and working farm with an assortment of self catering cottage converted from stone farm buildings. With the selected two dressed in reflective jackets we proceeded along the road for about 0.5miles before we reach Trewollock and then footpath and across fields back to retrace our steps down into Gorran Haven and an ice cream for some. 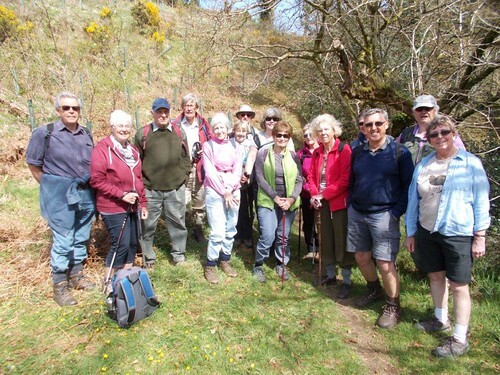 Another excellent walk that most people had not done before and as always good company. 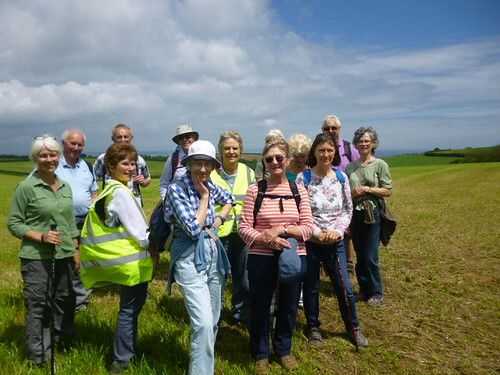 This was the first U3A walk we did when 5 of us set off in one car from Lostwithiel in 2013. PLEASE LET US KNOW BY FRIDAY 26TH MAY IF YOU WISH TO COME AND IF YOU CAN OFFER LIFT. Porth Farm to St Anthony’s Lighthouse: from this section of the coast path, we had great views of Towan beach and Porthbear beach and further on to the Manacles Rocks. 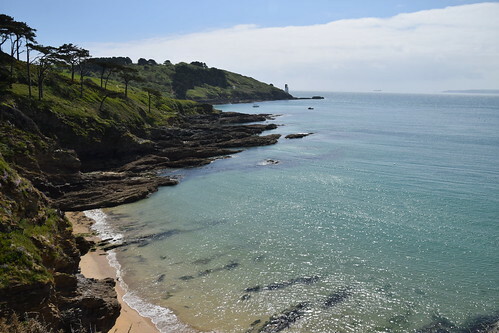 As we drew closer to St Anthony’s head, we had a great panoramic view of the Carrick Roads: the mouth of the Helford River, Falmouth beaches, Pendennis Point, Falmouth Harbour and Town, Mylor Harbour and Restronguet Creek further on and of course closer to us St Mawes. We went into the bird hide from where you might see the Peregrine falcons that nest on the cliff opposite. No luck today though! Once upon a time, you could visit the lighthouse but no longer. We leant that St Anthony lighthouse was commissioned by Trinity House in 1835 to warn ships of the presence of the Manacles Rocks and of the dangers of Black Rock sat square in the middle of the channel into the harbour. The fog warning for this stretch of water remained fairly basic until the 1950s, when a modern horn system replaced the massive bell, and it was at the same time that the white tower's lamp changed to electricity. In 1987, the keeper was retired and the lighthouse became fully automatic. St Anthony lighthouse's more modern claim to fame is that it featured in the opening credits and many scenes of the 1980s children's TV programme 'Fraggle Rock'. Further along on the way to Place, you can see a small white building which used to be the store for the paraffin used by the lighthouse. St Anthony’s Lighthouse to Place: we found a sheltered spot just above lovely deserted sandy beaches to have our picnic. The sun decided to break cover and from then on we had glorious weather for our walk. It was time to hear about St Mawes Castle and this is when we all started having fun with word games, using the very learned words that could be found in the texts that Annie had found in her internet research. See whether you can spot them as you read this report! St Mawes Castle is among the best-preserved of Henry VIII's coastal artillery fortresses, and the most elaborately decorated of them all. One of the chain of forts built between 1539 and 1545 to counter an invasion threat from Catholic France and Spain, it guarded the important anchorage of Carrick Roads, sharing the task with Pendennis Castle on the other side of the Fal estuary. St Mawes was designed to mount heavy 'ship-sinking' guns. But particular care was also taken with its embellishment, and it is still bedecked with carved Latin inscriptions in praise of King's Henry VIII and his son Edward VI. 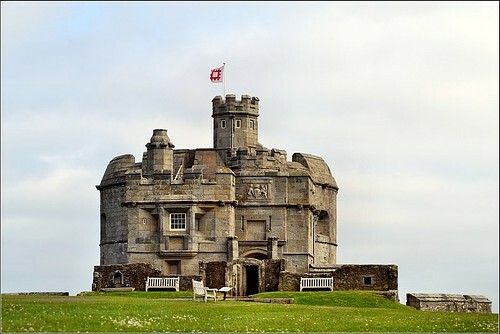 It owes its fine preservation to the fact that unlike Pendennis Castle, it was little developed after its completion. Easily falling to a landward attack by Civil War Parliamentarian forces in 1646, it remained neglected until partial re-arming during the 19th and early 20th centuries. Other coastal forts built by Henry VIII include Portland, Deal and Walmer Castles. We made our way to Place House (built in 1861 by Sir Thomas Spry in the style of a French Chateau) and we visited its wonderful church which is maintained by the Churches Conservation Trust. A holy well and Medieval stone coffin are located in the churchyard, the coffin having been discovered during the rebuilding of the chancel and restored by a local History Society. We walked towards the landing stage for the Place Ferry and we had good views of the front of Place House. The area in front of Place House was the pond of a tide mill until the 1860s when it was infilled to create lawns for the newly built house. In existence by 1540, the mill was originally associated with the priory and would have been used to mill grain. 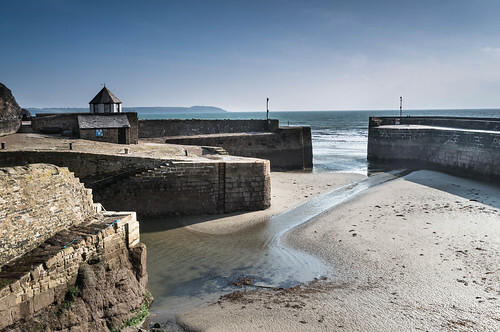 The slipway and boathouse to the north of the foreshore were built to provide for the twice daily steamer service from Falmouth and also the rowing ferry to St Mawes. Several of the Sprys were closely connected with the Royal Navy and the family also depended on fishing and boat building for its wealth. It maintained its own fishing fleet and owned a pilchard cellar based on Cellars beach. During World War II the house was requisitioned by the War Office and an anti-aircraft battery was placed to the South West to help protect Falmouth. The Place Ferry was run for many years as part of the Percuil and St Mawes Ferry, getting estate workers to work and children to school. As road use increased the ferries reduced and eventually went into abeyance. 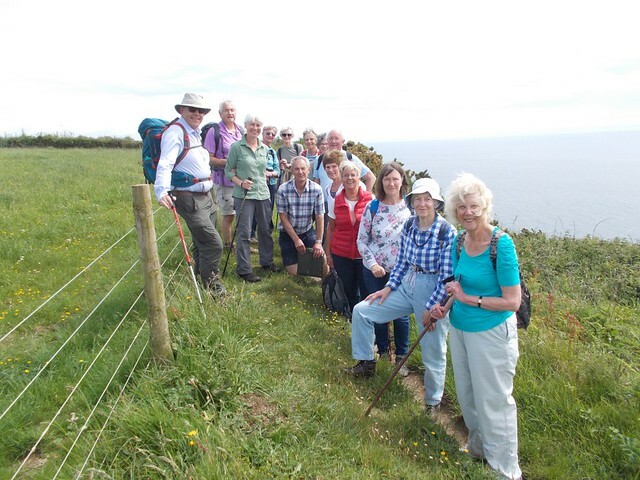 With the advent of the South West Coastal Path the current service started with the support of the Countryside Agency in the 1980s. 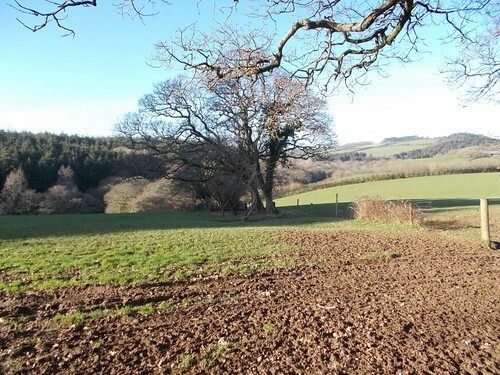 Place to Porth Farm: this section of the walk takes you through wooded banks and fields along the Percuil River. The spring flowers including bluebells were delightful. In 2008, the Percuil River was the site of the biggest ever mass stranding of dolphins. Twenty-one animals died after entering the shallow waters of the river for unknown reasons. By the time we got back to Porth Farm, the consensus was that we had walked more than 5 miles (as advertised in the leaflet)! Refreshments at the grey corrugated Citroën van, called Earl (see the pun?) run by the Thirsteacompany were most welcome! 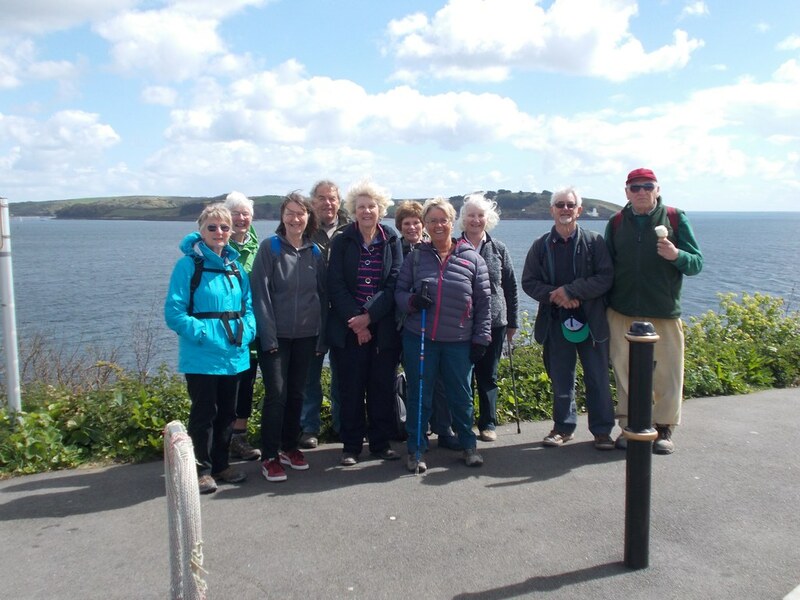 The walk takes in beautiful views of the coast, St Mawes, Falmouth in the distance and the Percuil River. We will also visit Place Church. Good facilities: toilets at Porth Farm and St Anthony’s Head and refreshments at the end of the walk. 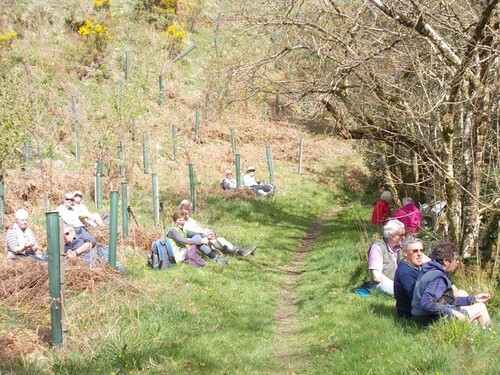 We will leave the Lostwithiel Community Centre Car Park at 9.30am in order to start the walk by 11.00am at the latest. Please note that if the weather forecast is not favourable for a coastal walk, I have a plan B! This was a bit different than normal in that we all caught the train to Falmouth on what was a full day out with a 4.5 mile walk, a break for tea/coffee, lunch and views of the famous harbour, St Anthony Head and St Mawes Castle. It felt like a Sunday School outing as 9 of us gathered in the shelter on Lostwithiel station waiting for the 9.00am train to Truro. With another two picking up the train at Par we were soon in Truro and making our connection for the Falmouth train; excitement at this stage was increasing and firm control was required. 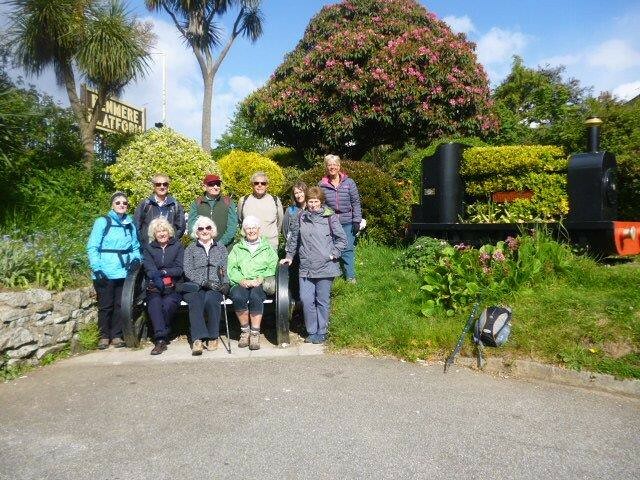 Alighting at Penmere Station a group photograph in the sunshine and beside a set of bogey wheels was called for as we headed out of the station and towards our minor road and footpath towards Swanpool. On the way we spoke with some allotment holders who told us of their plots and help from the Lottery Funding to create the 120 units and the 2 year waiting list that exists at present. Just a bit further on we were spell bound as two young ladies carried out some strange fitness routines specifically designed for the bottom area!-no takers this time from our female contingent but it may be the start of a new U3A group! Passing the Swanpool Nature Reserve, the only home of in Britain of the Trembling Sea Mat, this brackish lagoon was cut off from the sea around the time of the last ice age. Walking along the coast path with a very sharp shower but now full sun we come to Gyllynvase Beach and our 11.00 o'clock, at exactly 11.00, coffee break at the excellent café on the beach. After an excellent 30 minute break and some different cakes to go with our drink we continued along the sea front in front of the large Falmouth and Royal Duchy Hotels. The former was built in 1865 by the Falmouth Railway and Falmouth Docks companies in preparation for an influx of new visitors on the railway. The latter was built in 1893 as the Pendennis Hotel and was requisitioned as a hospital in the 1st World War. With Pendennis Castle in view we walk around the dry moat and with views of St Mawes Castle and the lighthouse on St Anthony's Head an ice cream van poses too much of a temptation for one of us. Falmouth Docks now lay ahead, the world's third largest natural harbour, with the large dry docks and navy vessels being refitted or serviced. Passing Falmouth Docks station and the small typical railway cottages we all gather to decide what we wanted to do with our free time before we caught a train back. Most had lunch, fish and chips and bangers and mash, did some shopping and even found time for a cream tea before all but one caught the train which arrived back in Lostwithiel at 5.15. After that brief visit it is no wonder that Falmouth is generally top of any survey of towns in Cornwall as a great place to live for families. A great response from the group and it was good not to have to worry about cars and we will have to have a look for some similar days out. 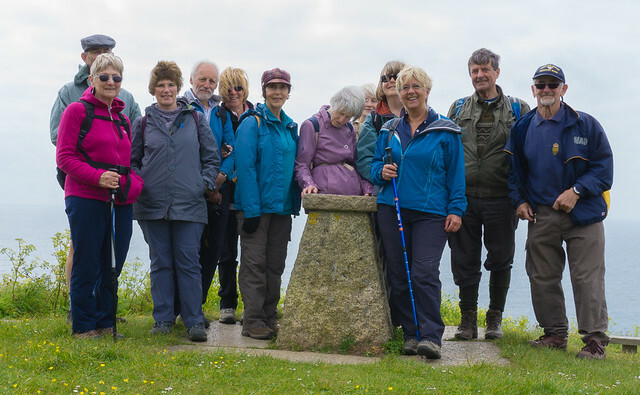 1) 4.5 MILE MODERATE WALK FROM PENMERE STATION TO PENDENNIS CASTLE AND RETURNING FROM FALMOUTH TOWN. 2) WE WILL BE TRAVELLING BY TRAIN FROM LOSTWITHIEL TO PENMERE STATION THE TRAIN LEAVING AT 9.00AM VIA TRURO TO PENMERE STATION. 4) WE WILL BE VISITING SWANPOOL -THE ONLY HOME IN THE UK OF THE TREMBLING SEA MAT, THE BEACHES OF GYLLYNGVASE AND CASTLE AND PENDENNIS POINT. 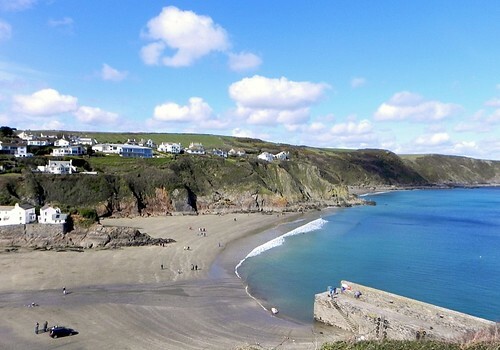 5) BRING A PICNIC OR EAT AT THE VARIOUS ESTABLISHMENTS IN FALMOUTH -A VISIT TO THE CAFE ON THE BEACH AT 11.00 MIGHT BE A GOOD START FOR OUR WALK ALONG THE COAST PATH. 6) AS NO CARS ARE INVOLVED IF YOU COULD LET US KNOW BY MONDAY 24TH SO WE HAVE AN INDICATION OF THE NUMBERS BUT PLEASE REMEMBER THAT WE CAN'T HOLD THE TRAIN UP! 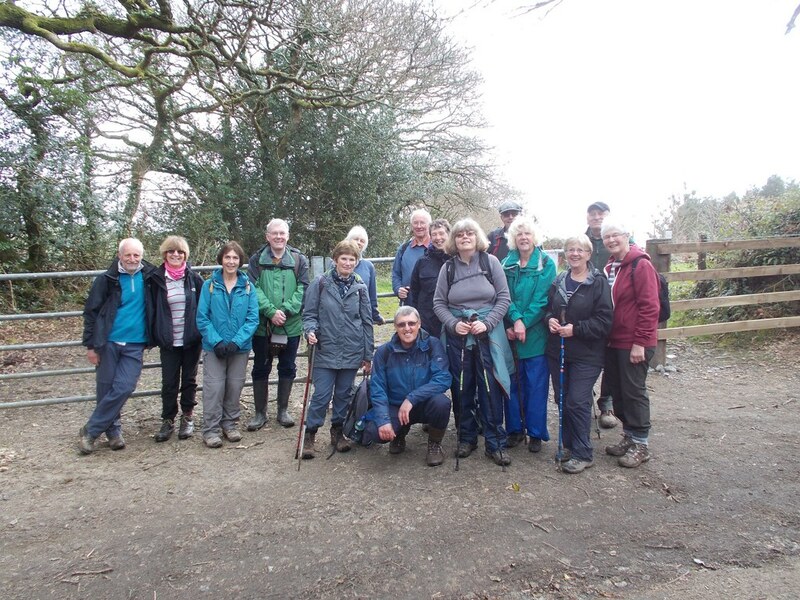 This was a repeat of a walk undertaken on May 12th 2015 when 6 walkers managed the 5.5 mile reasonably strenuous walk. This time 16 walkers met at the car park at St Neot on a beautiful April morning with the sun shining and very little breeze to cool us off. Many of the historical information given in that documented report will not be repeated here but can be archived from the web site if required. The London Inn was passed as we left St Neot, a public house that is now open again. Up the rickety stairs and gate and through two fields with about a dozen bullocks keeping an eye out for us we crossed onto a lane and past Tremaddock Farm onto the moors. We deviated slightly across the moor to see a stone hut circle, one of three in this area and close to a prehistoric enclosure known as Berry Castle containing the circular remains of a further 9 huts. Off the moor and into two wooded areas; Bowden Woods and Periok Woods both full of blue bell plants still to flower in the shaded woodland. Time for lunch along side the gently flowing River Fowey and our usual photograph both formal and informal River Fowey and our usual photograph both formal and informal. Over the sound of the river and the birds could also be heard the sound of the group singing Happy Birthday to one of our members who had joined us on her special day. After a bit more walking on the quiet lanes we reach Wenmouth Cross and a stroll down past Higher Newton and back to the car park. A thank you to all the drivers who make sure we all get to our destinations and back again! COULD YOU PLEASE LET US KNOW IF YOU WOULD LIKE TO COME ON THIS WALK AND IF YOU CAN OFFER TRANSPORT BY FRIDAY 7TH APRIL. Having just missed out on the really hot days prior to the 28th the weather forecast was reasonable as we set off towards Ladock on the A30. Sixteen of us were on the walk which was a good number bearing in mind the predicted mud and the gate that had to be climbed. Ladock woods are owned by the Duchy of Cornwall and have seen their history go from 19th century coppicing of oak and ash to 20th century conifer planting and from the mid 1980's the introduction of broadleaf species including cherry, chestnut, beech and lime. An interesting statistic mentioned in the walk information is that only 13% of Duchy land is in Cornwall, the rest dotted over 23 other counties with over half on Dartmoor. Encountering the first stretch of muddy paths, although not as bad as when we did the preliminary walk, we proceeded through the woods until we came out onto the narrow road to Mitchell and that gate which we all managed to get over, albeit with somewhat differing styles some more flashy than others! Turning right we then walked on the north side of St Enoder Wood and towards the settlement of Trendeal which was first recorded in 1201 with the name Dintel. Trelassick the other settlement passed was also recorded in mediaeval times , spelt Treoysech in 1279. Turning south again and following the signs to Bessigga we again meet some mud and water on the path as can be seen on the photograph-is that why the leader wore his shorts! Through a field now -very quickly and quietly- with signs warning of the “Bull in the Field” into the woods again and along side fields of spring cabbages we reach what is left of the old stone and cob cottage settlement of Bessigga which is reported to have been abandoned in the 1960's and has since fallen into ruin. We now cross the River Ladock and the B3275 to follow a footpath sign to Ladock Church. In 1802, the largest gold nugget at the time found in Cornwall was discovered in the tin streamworks on the River Ladock. It was made into a gold necklace and is in Truro Museum. Ladock Church our next landmark was originally built in the 13th century and extended in the 15th and had a major refurbishment in Victorian times. Stopping at the local shop/post office we had our lunch on the provided picnic benches but not before the owner of the shop was quizzed about their post office and the running of it and made us envious when she named the other two post offices within 2 miles of Ladock. 1) 5 MILE MODERATE CIRCULAR WALK AROUND AND THROUGH LADOCK WOODS. 2) WALK ON MINOR ROADS, FOREST TRACKS, FIELDS AND BRIDLEWAYS WITH SOME HILLS. 3) VERY MUDDY IN PLACES, 6 STILES, METAL GATE TO CLIMB OVER-STICKS WOULD BE USEFUL. 4) NO PERSONAL FACILITIES ON ROUTE. 5) WE WILL STOP IN LADOCK FOR LUNCH-EITHER BRING PICNIC OR PASTIES/SANDWICHES/CAKES AND TEAS/COFFEE AVAILABLE AT LOCAL SHOP. 6) CAR PARKING IN LADOCK WOODS. 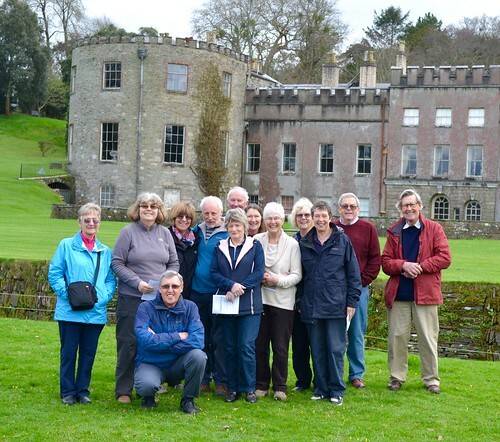 Seventeen walkers took part in the morning walk with fifteen taking up the offer of the afternoon guided tour of Port Eliot House. A leaflet produced by St Germans Rail User Group with financial assistance from Devon and Cornwall Rail Partnership and First Great Western was used as our guide. 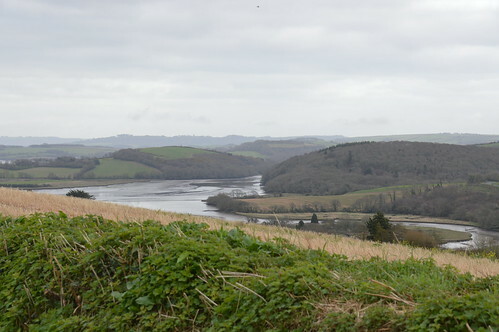 The village of St Germans grew on the bank of the river Tiddy. There appears to have been a church there from the 5th century and, for a short time, 926-1050, it was the seat of the Bishop of Cornwall. An Augustinian priory was founded in the 12th century and in medieval times the area was divided in two manors, one leased to the Prior and Canons at St Germans and the other, with lands along towards the present-day Polbathic, the Manor of Cuddenbeake. We walked along Newport, which was the industrial part of the town in medieval days when pots and tiles were made in the kilns. We saw the old tannery and forge and the Stable Yard, belonging to the Port Eliot Estate at the end of the Newport, is a fine example of the work of John Soane as part of his redesign of Port Eliot. We walked along a tiny lane called Well Lane, then turned into Bag Lane. We then made our way steeply up under a railway and then into Long Field. As the track rose towards the end of the field, we were able to see fine views towards Dartmoor ahead of us, Bodmin Moor and Kit Hill to our left and behind us. We also had great views of the estuary. We followed the footpath down to the village and then turned right into Quay Lane. We walked along the quay and had great views of the viaduct. The current viaduct was built in1908 to replace the old, largely wooden construction which had been a Brunel construction in 1859 and which the Earl had insisted should be painted white in order to “harmonize with the scenery in its vicinity”. We walked along the old quay and saw the old cannons in the gardens of Battery Cottage. It was then time to walk back towards the Church where we spent about 15mns. An earlier building on the site was the cathedral for Cornwall between 926 and 1030, before the area was absorbed into the Diocese of Exeter just before the Norman Conquest. The Normans then built a Priory on the site of the old cathedral, and the present church building dates to the 13th century. St Germanus of Auxerre visited Britain in 429 AD. There is no evidence that he visited the village, but the church and village were associated with him by the 10th century. There are other churches dedicated to St Germanus in Brittany, Wales and the Isle of Man. Here are some statistics for today's walk: 2.96 miles, excluding time in Port Eliot gardens. Duration 1hour 40minutes. Average speed 1.8mph. Height gain 366ft. Max altitude 250ft. We then had a guided tour for the house. The House is called Port Eliot because it was formally known as Port Priory. In the Middle Ages it was a flourishing monastic port. For many centuries the house was approached by water across what is now the park. The building is a multitude of different ages. The foundations in places are 9th century, there are 10th-century walls set with 13th-century lancet windows. The House received a major refit in the 18th century by Sir John Soane. The treasures in the house include a collection of portraits and a rare landscape painting by Joshua Reynolds. We will all have many lovely memories of our visit including of some quirky features. The most striking one has to be Robert Oscar Lenkiewicz’ Riddle Mural in the Round Room. Lenkiewicz worked on his masterpiece on and off for nearly 30 years but died before its completion. Half of the mural, in the 40-foot-diameter (12 m) room, shows death, destruction, insanity, unrequited love, and the apocalyptic end of the world. The other half reflects love and affection, friendships, harmony, proportion and consensus. Hidden in the work are various references to family skeletons, art history and cabalistic mysteries, hence the name – the Riddle Mural. We finished our visit with a stroll in the Park and Gardens. What a treat on such a mild spring day! The walk beside the River Lynher was very picturesque and we also enjoyed the “Camelia Walk”. A 1.5 hour guided tour of the house at 2.00pm. It will not be the basic tour that you get as an ordinary visitor for £8.00. We will get to see parts of the house that visitors do not get to see any more including the basement and the wine cellar as well as the Victorian kitchen. 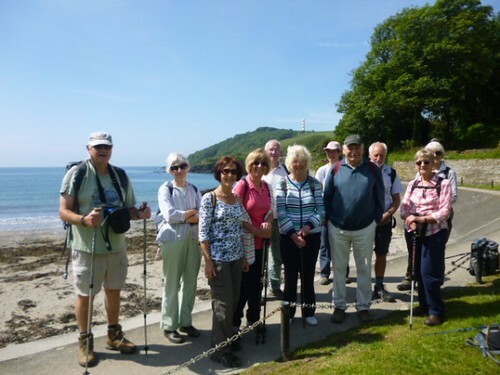 On a sunny day 15 walkers set off from Charlestown to walk south westerly on the coast path towards Porthpean. The weather forecast had changed from the previous day to give us a window until 1.00pm when it would be dry and bright-enough time to do this short 3 mile walk and maybe time for a drink at the end. Setting off past the docks at Charlestown with Polmear Island just off the coast and the area now known as Duporth inland. Duporth also know as Duporth Holiday Village was a holiday resort for over 50 years until its closure in 2006. The site was then sold to private developers and now contains new houses many in the traditional Cornish cottage style. The Holiday Village was built on the site of the old Duport estate and manor which was owned by Charles Rashleigh who developed Charlestown. After selling the site in 1933 to Seaside Holiday Camps it was requisitioned during the second world war for American and Indian forces before returning to a holiday camp after and then being sold in 1972 to Butlins. Passing Carrickowel Point we walk down the many steps to Porthpean beach where we were able to take our first photo which shows the wonderful blue sky and sandy beach with only a few other walkers and two metal detectors for company. 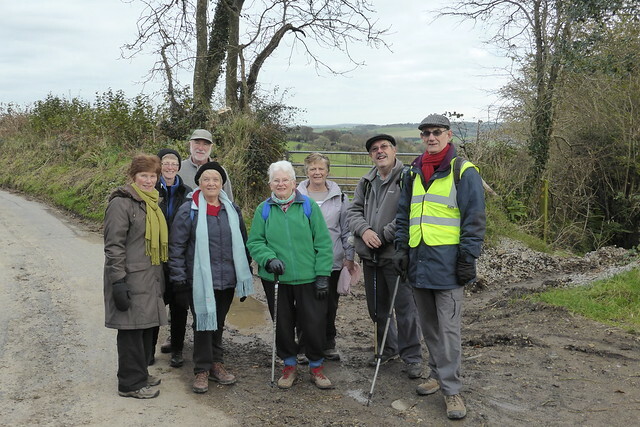 With the conveniences closed until Easter we pressed on uphill taking great care of the very muddy surface to turn right off the coast path through an equally muddy field to reach Higher Porthpean and some welcome tarmac. We had one faller in the mud but many whose balance was severely tested. After about 200yds we again face the muddy path which runs along side but the other side of the hedge to the wonderful green fairways of the Porthpean golf club. After a good clean up of our boots, after an assurance from the leaders that we were past the mud, we turned left and the right to walk down the pavement with the hospital to our left to be able to then turn right and back to Charlestown in time for that drink and for some a toasted tea cake and for one, who has missed the last few walks but who has just got his bus pass, a slice of pancake surprise-layers of pancakes sandwiched together with all sorts of treats, see below. Well it was Shrove Tuesday. All that and the sun still shone until on the way home that rain promised did come. We have some excellent walks planned for the spring and Annie has very kindly offered to take the next walk, more information to come. come and if you are able and willing to offer transport. 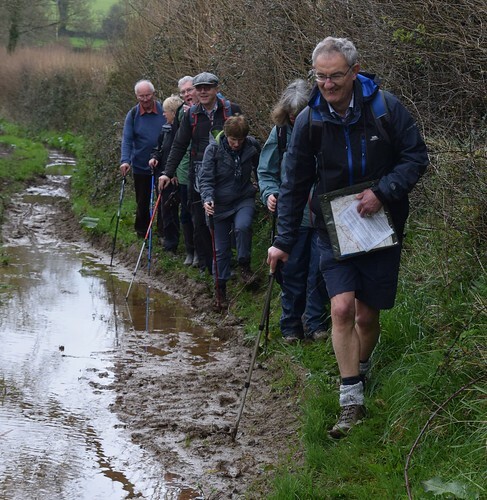 Twenty walkers put their faith into the weather forecast and set off for Grampound. Our optimism was rewarded: it had stopped raining by the time we reached the car park behind the school and the weather became sunnier and warmer as the day progressed. We walked up the main road until, half way up the hill, we turned right towards Creed. We followed the minor road for about a mile and reached Creed Church. The Church is worth a visit and you can still see the remains of the original stained glass windows. Of particular interest is the fact that in 1791 the vicar of Creed Church, William Gregor, discovered a new metal which he isolated from a sample of magnetic sand. He named it menachite after Mannachan, where it was found. In 1795, a Prussian chemist “discovered” the same element and named it titanium. His impressive name involving Greek mythology was more favoured by the scientific community! The Christening Bowl in the Church is made of titanium to commemorate its discovery by William Gregor. From Golden, we walked on a busy road before turning left into the Trewithen Gardens entrance and the daffodils made for a very pretty and cheerful sight. We found some picnic tables and old tree stumps to sit on and have our lunch and we could not believe how glorious the weather was. Not a drop of wind! The grounds of Trewithen, now owned by the Galsworthy, have been described as a “masterpiece of landscape gardening” and consist of 30 acres of woodland gardens and 200 acres of parkland. 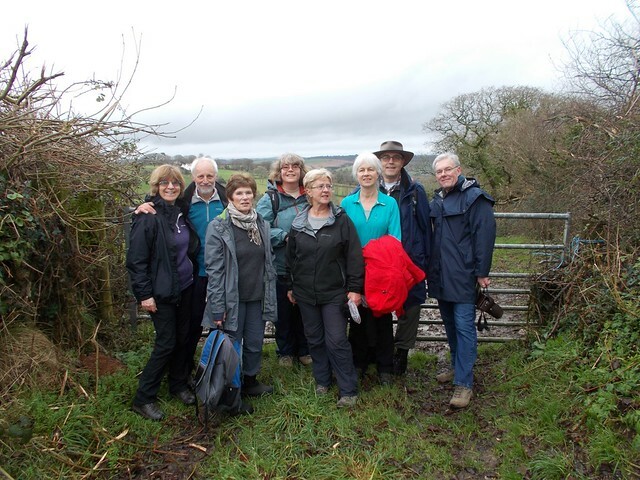 For the final stage of our walk, we walked on the bridleway from the Trewithen Estate to Grampound. The bridleway is the old coach road from Truro to St Austell which, until 1834, was the main road. It is thought to have been built by the romans. Fifteen Roman coins have been found along the road. After our five mile walk, most of us decided to treat ourselves to tea/coffee and cake in the community coffee shop run by volunteers. It was excellent value for money. A) A 5 MILE WALK STARTING FROM GRAMPOUND VILLAGE CAR PARK WHICH WILL TAKE US THROUGH CREED, GOLDEN AND TREVITHEN GARDENS. SOME OF THE WALKING WILL BE ON MINOR ROADS. B) AN EASY TO MODERATE WALK (ONE SHORT STEEP HILL). IT SHOULD LAST 3 HRS PLUS BREAKS (E.G TO VISIT CREED CHURCH) . I AM DOIND A SECOND "RECKIE" NEXT WEEK TO CHECK THE STATE OF ONE OR TWO PATHS BUT I CAN ALREADY WARN YOU THAT THE BRIDLEPATH FROM TREWITHEN GARDENS TO GRAMPOUND WILL BE MUDDY! D) WE WILL FIND SOMEWHERE TO PICNIC IN THE GROUNDS OF THE TREWITHEN ESTATE, WEATHER PERMITTING. IF NOT WE WILL HAVE TO WAIT UNTIL WE ARE BACK IN GRAMPOUND. PLEASE LET ME KNOW BY FRIDAY 10TH FEBRUARY IF YOU ARE ABLE TO COME AND/OR OFFER TRANSPORT. 18 walkers had signed up for this walk but it was definitely a case of "rain stopped play". Reluctantly the walk was cancelled. We will do it another day! PLEASE LET ME KNOW BY FRIDAY 27TH JANUARY IF YOU ARE ABLE TO COME AND/OR OFFER TRANSPORT. In view of the weather forecast for most of Cornwall with heavy rain predicted from 11 till 3 and with heavy rain on Monday making Ladock Woods even more muddy and wet we decided to repeat a walk we last completed on November 26th 2013. This was the first walk that Janet and I had the pleasure of leading after our arrival in Lostwithiel in the August of that year. It is interesting to compare the photographs as the number of walkers is the same -ten but all the people in the photograph except one is different-can you spot the person? can you believe that he or she is three years older? The walk takes you up Tanhouse Road to the footpath on your left up the hill and turn right at the top to walk to cross Tanhouse Road and Bodmin Hill before joining the footpath down past Restormel Castle and onto Restormel Road. We would have normally walked back over the river and railway bridge to the Duchy Nursery -and maybe even a drink or cake-but with the bridge closed from 9th for repairs we walked back along Restormel Road and to Lostwithiel where we all decided to stop for drinks and two of us -can you name those people?-had a fruit scone. No rain had fallen during our walk so we can consider ourselves lucky. 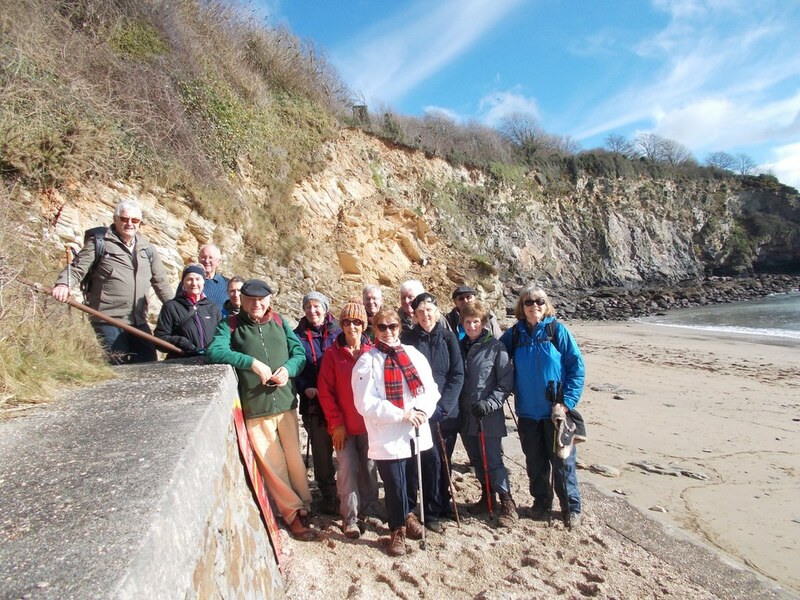 We will do the Ladock walk, weather permitting, on March 14th. She will contact regular walkers with the details in due course. 3) VERY MUDDY IN PLACES, 6 STILES, METAL GATE TO GET OVER-STICKS WOULD BE USEFUL. AND TEAS/COFFEE AVAILABLE AT LOCAL SHOP.